Before he died, Samuel Beckett (1906–89) asked for his letters to be published, but stipulated that these should consist of 'only those letters that have a bearing on my work'. 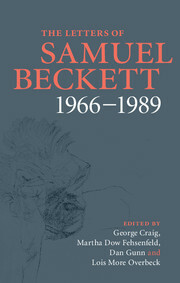 The Letters of Samuel Beckett offers the most comprehensive range of letters possible, within the limits of this requirement. It sheds new light on one of the greatest literary figures of the twentieth century, offering readers an unprecedented opportunity to discover the life and work of a literary giant in his own words.